Charter Oak surrounded San Marino on Friday. SAN MARINO — Charter Oak High School’s football team found itself in the shootout most expected on Friday night against San Marino. And in the end, the Chargers were the ones who didn’t run out of ammo. Zion Echols rushed for 302 yards and five touchdowns as the Chargers withstood two rallies by host San Marino to post a 49-31 win and punch their ticket into next week’s CIF-Southern Section Central Division semifinals. Charter Oak improved to 8-4 and will host Colony in next week’s semifinals. San Marino finished 9-3. WHITTIER — La Serna High School may have finished second in the Del Rio League and wasn’t considered one of the favorites for the CIF-SS Southeast Division football championship, but the Lancers, who won it last season, believe the title is theirs until someone takes it away from them. They continued to live by that motto on Friday. Enrique Pacheco threw for 112 yards and two scores, including the game-winner in the fourth quarter, and La Serna advanced to the division semifinals for the fifth consecutive season with a 38-35 victory over top seed St. Francis at California High School. Anthony Garcia rushed for 143 yards and a touchdown and Ruben Rios had 77 and a score for the Lancers, who improved to 10-2 and will travel to Crescenta Valley for next week’s semifinals. Miles Bryant, in place of injured Jeremiah Martin, threw for 267 yards and four touchdowns, and Dylan Crawford had five receptions for 136 yards for St. Francis, which finished 11-1. HACIENDA HEIGHTS — Redemption or revenge, whatever you want to call it, it was sweet for Los Altos on Friday night. 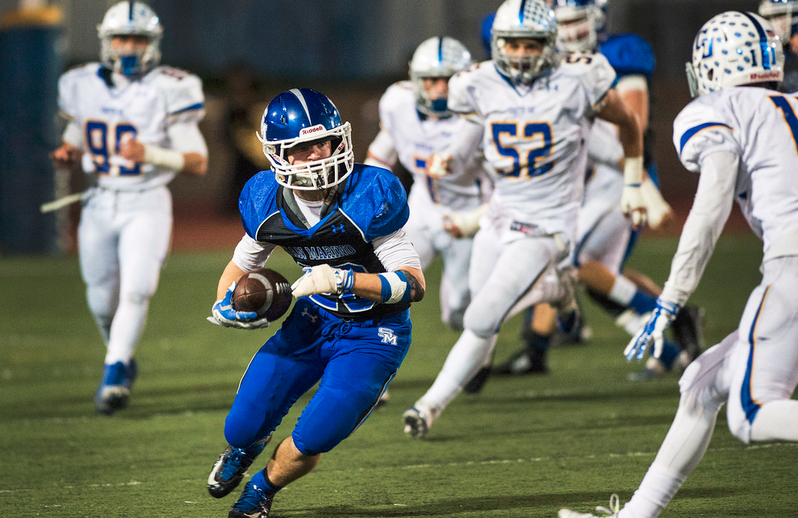 The Conquerors avenged a last-second loss to Monrovia (10-2) earlier in the season with a resounding 45-35 victory, ending the Wildcats’ season and propelling themselves into the CIF-SS Central Division semifinals. Los Altos (7-5) dominated the game on the ground, behind a great night in the young career of sophomore running back Tyler Nevens, who rushed for 290 yards and five touchdowns. SOUTH PASADENA — The Pasadena Poly Panthers are one step closer to reaching their goal of playing in the Northwest Division championship game. They advanced to the semifinals Friday night by defeating visiting Linfield Christian 20-11 at South Pasadena High. After a scoreless first quarter, Pasadena Poly (12-0) got on the scoreboard just before the end of the first half. REDLANDS — Bradley Mowbray usually does a lot of his damage for Arrowhead Christian Academy on offense. On Friday night, he added defense to the equation. The senior quarter back threw for one touchdown, ran for one more and had three interceptions in the end zone to squash Maranatha drives as the Eagles advanced the CIF-Southern Section Northwest Division semifinals with a 43-28 victory over the Minutemen at Citrus Valley High School. There is no two-minute warning in high school, but Sierra Canyon High School took that time element to heart in its CIF-Southern Section Mid-Valley quarterfinal matchup against Rosemead at Granada Hills High on Friday night. The Trailblazers took the lead for the first time with just less than two minutes to play in the first half, and rolled to a 33-12 victory over the Panthers. The Mission Valley League champion Panthers (7-5) built a 12-0 lead through the first 14 minutes of the game. The second-seeded ‘Blazers scored less than a minute after Jesus Renteria kicked a 42-yard field goal to make 12-6 and then went up 13-12 just before the half. 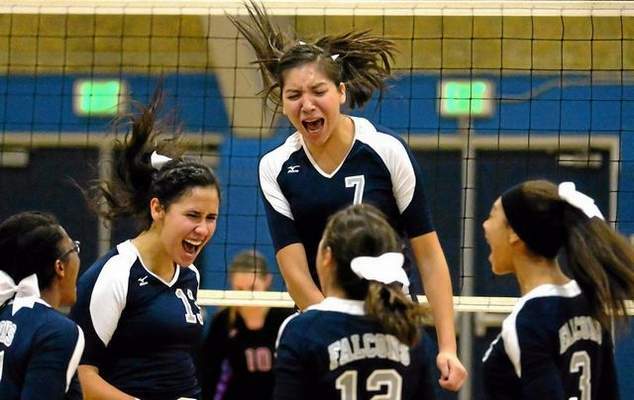 Pasadena Poly at Nipomo, 7:30 p.m.
DUARTE In the biggest match in the history of Duarte High School, the girls volleyball team completed a miraculous come-from-behind five-set victory in the CIF Southern Section Division 4A semifinals Tuesday night before a packed gym. 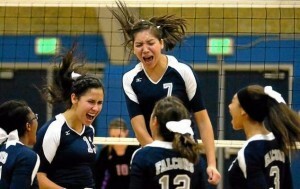 The second-ranked Falcons, trailing 2-0, won the final three sets and defeated visiting Desert High from Edwards Ari Force Base 15-25, 27-29, 25-23, 27-25, 15-11 and will make their first-ever appearance in the title match Friday or Saturday at either Cerritos or Fullerton College against top-ranked Cate (22-1) of Carpinteria. The young Duarte (26-8) team could have folded after a tough second-set loss to the third-ranked Scorpions, but fought off a slow start in the third set. Trailing 13-6, the Falcons came all the way back by outscoring Desert 19-12, and seemed to take control at that point in the match.